Pedobacter saltans Steyn et al. 1998 is one of currently 32 species in the genus Pedobacter within the family Sphingobacteriaceae. The species is of interest for its isolated location in the tree of life. Like other members of the genus P. saltans is heparinolytic. Cells of P. saltans show a peculiar gliding, dancing motility and can be distinguished from other Pedobacter strains by their ability to utilize glycerol and the inability to assimilate D-cellobiose. The genome presented here is only the second completed genome sequence of a type strain from a member of the family Sphingobacteriaceae to be published. The 4,635,236 bp long genome with its 3,854 protein-coding and 67 RNA genes consists of one chromosome, and is a part of the Genomic Encyclopedia of Bacteria and Archaea project. 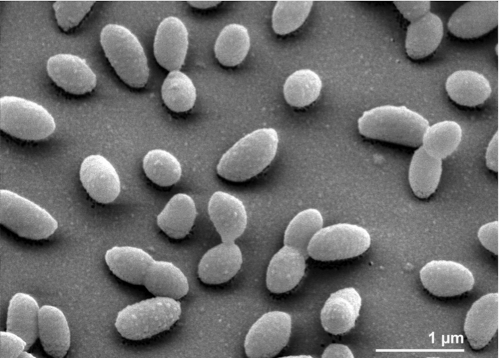 Strain 113T (= DSM 12145 = LMG 10337 = NBRC 100064) is the type strain of the species Pedobacter saltans , one of currently 32 validly named species in the genus Pedobacter . We prefer to use here the strain designation ‘113’ as originally published by Steyn et al. in 1992  and as also shown in the LMG online catalogue  and in the StrainInfo database  over the designation ‘LMG 10337T’ which was later used for the description of the species by the same authors . The genus name is derived from the Latinized Greek word 'pedon' meaning 'the ground, earth' and the Neo-Latin word 'bacter' meaning 'rod', yielding 'Pedobacter', the 'rod from soil' . The species epithet is derived from the Latin word 'saltare' meaning 'to dance', yielding 'saltans', referring to the gliding motility of the strain' . P. saltans strain 113T was isolated from soil in Iceland; several more strains belonging to the species were isolated from soil in Iceland, Belgium (Brussels) and Germany (Rüdesheim) . Members of the genus Pedobacter were isolated from various environments including different soils [1,6-10], water [11-13], a nitrifying inoculum , glaciers [15,16], fish  and compost . Here we present a summary classification and a set of features for P. saltans strain 113T, together with the description of the complete genome sequence and the genome annotation. A representative genomic 16S rRNA sequence of strain 113T was compared using NCBI BLAST [18,19] under default settings (e.g., considering only the high-scoring segment pairs (HSPs) from the best 250 hits) with the most recent release of the Greengenes database  and the relative frequencies of taxa and keywords (reduced to their stem ) were determined, weighted by BLAST scores. The most frequently occurring genera were Pedobacter (53.4%), Sphingobacterium (33.3%), Mucilaginibacter (5.0%), Flavobacterium (4.1%) and 'Sphingoterrabacterium' (2.1%) (95 hits in total). Regarding the two hits to sequences from members of the species, the average identity within HSPs was 99.7%, whereas the average coverage by HSPs was 97.6%. Regarding the 20 hits to sequences from other members of the genus, the average identity within HSPs was 92.8%, whereas the average coverage by HSPs was 84.1%. Among all other species, the one yielding the highest score was Pedobacter lentus (EF446146), which corresponded to an identity of 93.2% and an HSP coverage of 93.4%. (Note that the Greengenes database uses the INSDC (= EMBL/NCBI/DDBJ) annotation, which is not an authoritative source for nomenclature or classification.) The highest-scoring environmental sequence was HM008274 ('anodic biomass air-cathode single chamber microbial fuel cell clone 9week.anode.2'), which showed an identity of 94.6% and an HSP coverage of 83.8%. The most frequently occurring keywords within the labels of environmental samples which yielded hits were 'skin' (8.6%), 'fossa' (4.2%), 'poplit' (2.2%), 'soil' (2.2%) and 'forearm, volar' (2.0%) (152 hits in total). Interestingly, several of the most frequent keywords relate to a mammalian or clinical habitats, which may allude to some yet unknown ecological features of P. saltans, taking into account that all known isolates are from soil in different countries . However, environmental samples which yielded hits of a higher score than the highest scoring species were not found. Figure 1 shows the phylogenetic neighborhood of P. saltans in a 16S rRNA based tree. The sequences of the four 16S rRNA gene copies in the genome differ from each other by up to one nucleotide, and differ by up to three nucleotides from the previously published 16S rRNA sequence (AJ438173). The cells of P. saltans are short rods (0.5 × 0.7-1.0 µm) with rounded or slightly tapering ends (Figure 2) . Three of the four strains belonging to P. saltans were described as being motile via gliding . P. saltans cells strain Gram-negative and are non-spore-forming (Table 1). Strain 113T is strictly aerobic and chemoorganotrophic . Colonies on modified TSA are smooth, light yellow to yellow, translucent, round, 2-5 mm in diameter, convex to slightly umbonate with entire margins . On nutrient agar colonies are smooth, yellow, round, 2-4 mm in diameter, convex with entire to scalloped margins . The temperature range for growth is normally between 5°C and 30°C . The biochemical features and antibiotic resistance of P. saltans has been described previously . Strain 113T produces acetoin from sodium pyruvate, degrades chondroitin sulfate and hydrolyzes aesculin. It grows on heparin, which is degraded by inducible enzymes. Good growth occurs on nutrient agar or on regular or modified TSA. P. saltans does not produce H2S from thiosulfate and does not grow on MacConkey agar . P. saltans can be differentiated phenotypically from other Pedobacter species by its inability to assimilate D-cellobiose and the ability to utilize glycerol. The organism does not reduce nitrate . The cell wall of the members of the genus Pedobacter contain sphingolipids and menaquinone-7 as the predominant menaquinone system [11-13]. Strain 113T contains the following fatty acids: iso-C15:0 (31.4%), C16:1ω7c (19.6%), iso-C17:0 3-OH (12.7%), iso-C15:0 2-OH (8.9%), iso-C17:1ω9c (6.6%), C16:0 (4.0%), anteiso-C15:0 (2.9%), iso-C15:0 3-OH (2.8%), C15:0 (1.4%), C15:1ω6c (1.4%), and C16:1ω7c (19.6%) which are acids typical of the genus. It also contains traces of C14:0, C16:1ω5c, and C16:0 3-OH . P. saltans 113T (DSM 12145), was grown in DSMZ medium 605 (Nutrient agar (Oxoid CM3))  at 28°C. DNA was isolated from 0.5-1 g of cell paste using Jetflex Genomic DNA Purification Kit (GENOMED 600100), modified by 1 hour incubation at 58°C with 20 µl proteinase for improved cell lysis. DNA is available through the DNA Bank Network . The genome was sequenced using a combination of Illumina and 454 sequencing platforms. All general aspects of library construction and sequencing can be found at the JGI website . Pyrosequencing reads were assembled using the Newbler assembler (Roche). The initial Newbler assembly consisting of 44 contigs in two scaffolds was converted into a phrap  assembly by making fake reads from the consensus, to collect the read pairs in the 454 paired end library. Illumina sequencing data (6,233.8 Mb) was assembled with Velvet  and the consensus sequences were shredded into 1.5 kb overlapped fake reads and assembled together with the 454 data. The 454 draft assembly was based on 112.7 Mb 454 draft data and all of the 454 paired end data. Newbler parameters are -consed -a 50 -l 350 -g -m -ml 20. The Phred/Phrap/Consed software package  was used for sequence assembly and quality assessment in the subsequent finishing process. After the shotgun stage, reads were assembled with parallel phrap (High Performance Software, LLC). Possible mis-assemblies were corrected with gapResolution , Dupfinisher , or sequencing cloned bridging PCR fragments with subcloning. Gaps between contigs were closed by editing in Consed, by PCR and by Bubble PCR primer walks (J.-F. Chang, unpublished). A total of 205 additional reactions were necessary to close gaps and to raise the quality of the finished sequence. Illumina reads were also used to correct potential base errors and increase consensus quality using a software Polisher developed at JGI . The error rate of the completed genome sequence is less than 1 in 100,000. Together, the combination of the Illumina and 454 sequencing platforms provided 664.5 × coverage of the genome. The final assembly contained 205,963 pyrosequence and 82,382,711 Illumina reads. The genome consists of a 4,635,236 bp long chromosome with a G + C content of 36.6% (Table 3 and Figure 3). Of the 3,921 genes predicted, 3,854 were protein-coding genes, and 67 RNAs; 62 pseudogenes were also identified. The majority of the protein-coding genes (64.8%) were assigned a putative function while the remaining ones were annotated as hypothetical proteins. The distribution of genes into COGs functional categories is presented in Table 4. 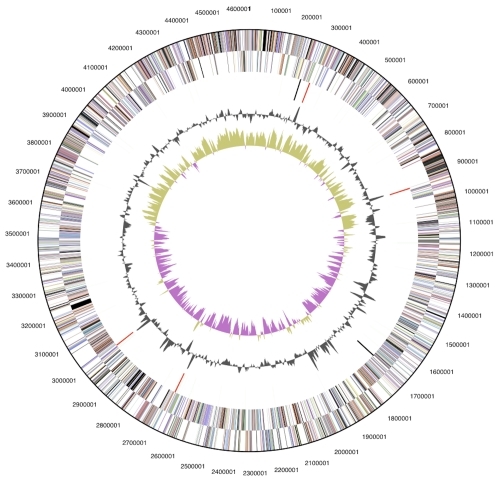 Graphical circular map of genome. From outside to the center: Genes on forward strand (color by COG categories), Genes on reverse strand (color by COG categories), RNA genes (tRNAs green, rRNAs red, other RNAs black), GC content, GC skew. An estimate of the overall similarity between Pedobacter heparinus and P. saltans  was generated with the GGDC-Genome-to-Genome Distance Calculator [49,50]. This system calculates the distances by comparing the genomes to obtain high-scoring segment pairs (HSPs) and interfering distances from a set of three formulae (1, HSP length / total length; 2, identities / HSP length; 3, identities / total length). The comparison of P. heparinus and P. saltans revealed that an average of only 4.7% of the two genomes are covered with HSPs. The identity within these HSPs was 82.3%, whereas the identity over the whole genome was 3.8%. The fraction of shared genes in the genomes of P. heparinus, P. saltans and Novosphingobium aromaticivorans  is shown in a Venn diagram (Figure 4). The phyogentically distant reference genome of N. aromaticivorans was selected based on its similar genome size and due to a lack of complete reference type strain genomes from the Sphingobacteriaceae. The numbers of pairwise shared genes were calculated with the phylogenetic profiler function of the IMG ER platform . The homologous genes within the genomes were detected with a maximum E-value of 10-5 and a minimum identity of 30%. Only about one quarter of all genes (954 genes) are shared by all three genomes, whereas the two Pedobacter species share 2,732 genes, corresponding to 63.7% (P. heparinus) and 70.9% (P. saltans) of their genes. 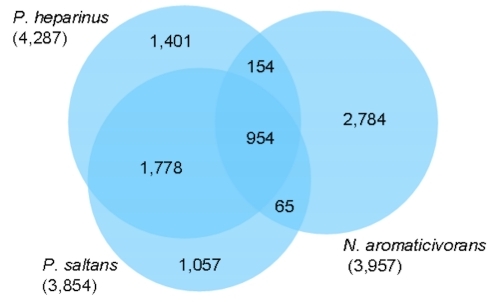 The pairwise comparison of N. aromaticivorans with the two Pedobacter species revealed only 154 (P. heparinus) and 65 (N. aromaticivorans) homologous genes (Figure 4). Venn diagram depicting the intersections of protein sets (total number of derived protein sequences in parentheses) of P. heparinus, P. saltans and N. aromaticivorans. Among those genes that are shared by the three genomes, are those which might be responsible for the yellow color of the organisms. These genes encode enzymes that are involved in the synthesis of carotenoids. Biosynthesis of carotenoids starts with geranylgeranyl pyrophosphate synthases combining farnesyl pyrophosphate with C5 isoprenoid units to C20-molecules, geranylgeranyl pyrophosphate. The phytoene synthase catalyzes the condensation of two geranylgeranyl pyrophosphate molecules followed by the removal of diphosphate and a proton shift leading to the formation of phytoene. Sequential desaturation steps are catalyzed by phytoene desaturase followed by cyclization of the ends of the molecules catalyzed by the lycopene cyclase . Genes encoding lycopene cyclases (Phep_2088, Pedsa_2222, Saro_1817) and phytoene synthases (Phep_2092, Pedsa_2218, Saro_1814) were identified in the genomes. In the two Pedobacter species, genes coding for phytoene desaturases (Phep_2093, Pedsa_2217) were also identified. A carotene hydroxylase gene (Saro_1168) was only identified in the genome of N. aromaticivorans. As the two Pedobacter species are known for their ability to degrade heparin, it is not surprising that the genomes encode several heparinase encoding genes: seven (P. saltans) and five (P. heparinus) heparinases, were identified, whereas N. aromaticivorans encodes only one heparinase. Fucoidan degradation was not determined experimentally, but is assumed as both P. saltans and P. heparinus have genes for eleven and ten α-fucosidases respectively. In addition, 12 (P. saltans) and 18 (P. heparinus) α-sulfatases genes were identified, whereas N. aromaticivorans contains only five α-sulfatases and no α-fucosidase genes. 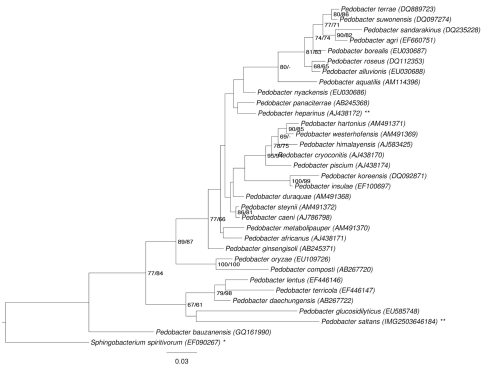 Experimental evidence for the fucoidan hydrolysis in Pedobacter has not been found, but for Mucilaginibacter paludis and M. gracilis, which are also members of the family Sphingobacteriaceae, have been experimentally confirmed to exhibit fucoidan degradation . Moreover, Sakai et al. reported the existence of intracellular α-L-fucosidases and sulfatases, which enable ‘F. fucoidanolyticus’ to degrade fucoidan. We would like to gratefully acknowledge the help of Helga Pomrenke (DSMZ) for growing P. saltans cultures. This work was performed under the auspices of the US Department of Energy Office of Science, Biological and Environmental Research Program, and by the University of California, Lawrence Berkeley National Laboratory under contract No. DE-AC02-05CH11231, Lawrence Livermore National Laboratory under Contract No. DE-AC52-07NA27344, and Los Alamos National Laboratory under contract No. DE-AC02-06NA25396, UT-Battelle and Oak Ridge National Laboratory under contract DE-AC05-00OR22725, as well as German Research Foundation (DFG) INST 599/1-2. Felsenstein J. Inferring phylogenies. Sinauer Associates Inc., Sunderland, Massachusetts 2004.